I walk east on Powell. It’s a clear winter’s day of long shadows and a cold breeze punctuated by the quintessential odour of rendered chicken. It’s under these bracing conditions that I approach the Powell Street Overpass. For automobile, bus and bicycle alike, the overpass is a new, smooth, and well-constructed stretch of roadway, and an obvious improvement over the previously lumpy level crossing/S-turn near Raymur. Approached at a slack walking pace, however, and something’s not quite right, not quite so smooth and easy. A number of capital-intensive influences are tied to this roadway. While these are too big and too ephemeral to be detected by mere mortals, they appear to have left both tell-tale and arcane signs of their presence and continued interest. At least, I think so. The sublimated ground begins at the eastern approach. The new overpass –which was completed in the Fall of 2014- comes with a Pattison-installed digital sign of impressive proportions. In this industrial zone of grain elevators, rendering plants, foundries, and warehouses comes an endlessly repeating mantra of reality shows, classic rock, phone plans, and Pattison. Just beyond is the overpass itself -a $50 million project funded by Port Metro Vancouver, TransLink, Transport Canada, Canadian Pacific, and the City of Vancouver. Amongst the touted benefits, the overpass “[a]llows for the possibility of an improved rail connection south to the U.S. via the Burrard Inlet line.” That is, it provides CP -everybody’s favourite corporate citizen- with space for a new east-west track south of the existing tracks. 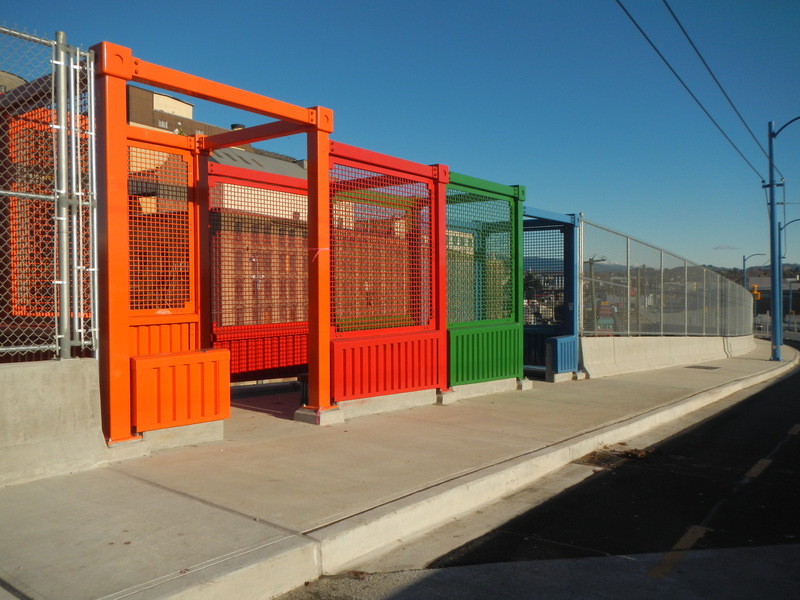 Near the overpass’s apex on the north side is a brightly painted metal structure offering … shelter? No: there’s no cover and the construction is porous to the wind and rains. A viewpoint? 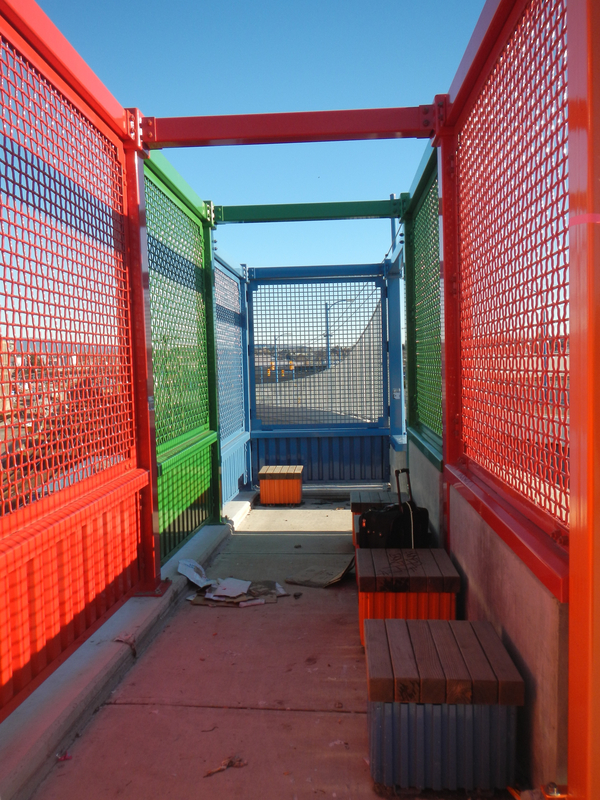 Technically, yes; however, the metal weave employed grievously impedes an enjoyment of the vista. But for want of something better, lets call it a viewpoint. To the south the viewpoint overlooks a “park” –that is, a small and triangular island of grass, concrete and benches tucked-in between Cordova and Powell. Taken together, the viewpoint and park give off the stink of an officially sanctioned “public amenity,” of the sort defined by a committee of those unlikely to ever make use of them. What makes me hesitate to dismiss some of these overpass-associated developments as so much bureaucratic make-work, bafflegab, and incompetence, is the proximity of a development of another sort. Less than 200 metres due south of the viewpoint, on the north side of the 900 Block of East Hastings, Wall’s Strathcona Village condo project employs the same colour scheme in its marketing: blue, green red and –to a lesser degree- orange. Ugh, a patch of grass with a slab of concrete wedged between opposing lanes of a de facto freeway (that we’re constantly told don’t exist in urban-progressive Vancouver). Imagine sitting there with your decaf caramel latte from the adjacent mid-stream drive-through Starbucks while your Shih Tzu scampers about, digging amongst discarded take-out cups and wayward hubcaps. 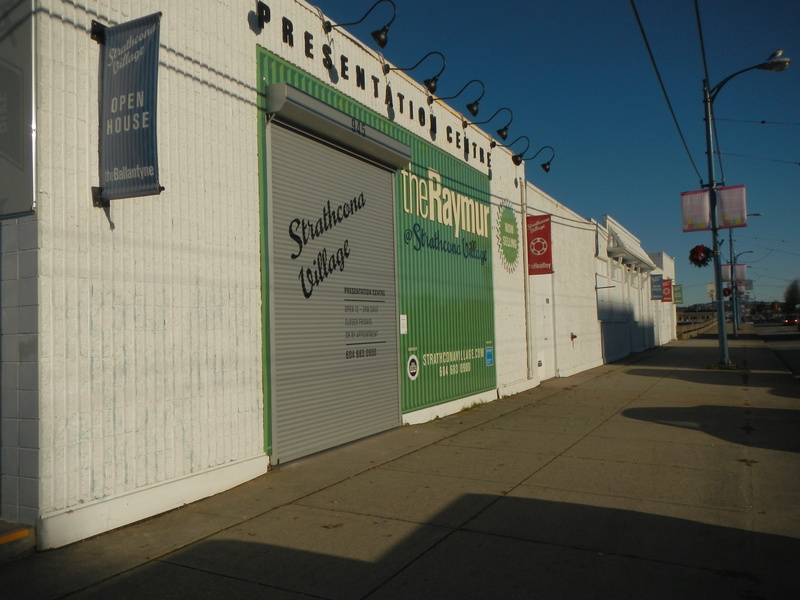 Just sit back, enjoy the view of the storage company warehouse on one side and stacks of shipping containers behind a chain link fence on the other as cars and trucks whiz noisily by only a few feet away. 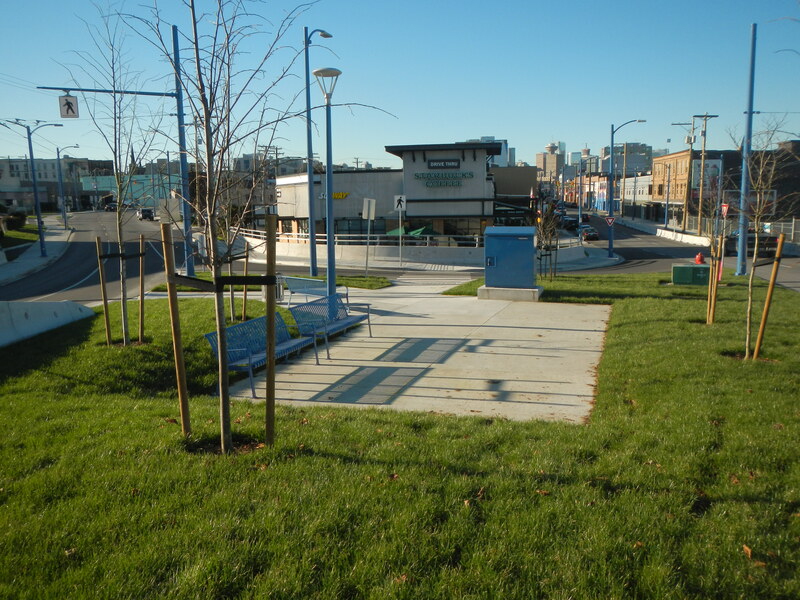 As I recall, that “park” was a patch of grass with a bench before the redevelopment (if “redevelopment” means the addition of a concrete slab) that the city never even bothered to maintain, so it usually looked like an abandoned and overgrown lot. Good job, Vision! Now you can bump up the “new parks created” number on your next re-election brochure.